This Popular Add-On Grooming Service Only Takes 2-Minutes! Puppy feather extensions have become quite an in-demand service that grooming clients love. And grooming salons are able to charge a premium for this quick add-on service. It is a fabulous service to add to a grooming salon since it only takes a couple of minutes to do and doesn't cost much for the tools. Below, you can find a tutorial video that shows just how quick & easy it is to apply the feathers. We have also included information on where you can purchase the supplies and feathers for under $20. As well as printable promo pieces that will help to sell this easy add-on service for you. 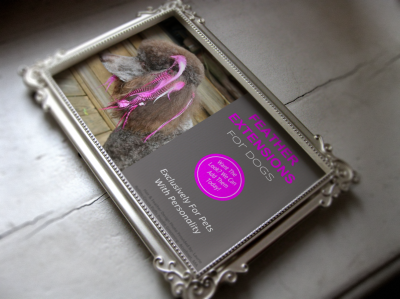 Did you know that you can put the feather extensions into a dog's ear in just two minutes? We didn't know that it was that easy until we found a short tutorial video on Youtube that shows you how. You can click on the video above to view it. In the video, you can see exactly how to do it and what tools you will need. Amazon.com had a nice kit for $9.35 (at the time of posting this). It included the tools, beads and 10 feathers. 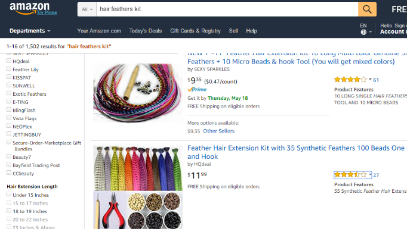 They also carried several other feather kits for under $10. With starter kits costing this little, you can recoup your investment after just one or two customers. This quick and fun little add-on could easily be priced at $5 to $10 depending upon your location and local market. Effortlessly sell this fun & easy add-on service by simply displaying one of our two feather extensions signs and by handing out coupons to entice customers to try them. Easy edit templates are included in our Advanced Groomer's Profit Kit and ready to print pdf's are included in our basic kit.